Hilda can never sit still for long without setting off on another adventure. She can’t resist exploring her enchanting world—a place where trolls walk, crows speak, and mountains move. The magic and folklore of the wild, windswept North come alive in this book about an adventurous little girl and her habit of befriending anything, no matter how curious it might seem. 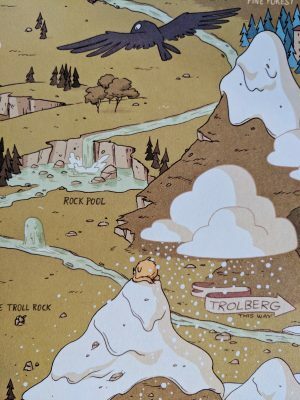 While on an expedition to illustrate the magical creatures of the mountains around her home, Hilda spots a mountain troll. As the blue-haired explorer sits and sketches, she slowly starts to nod off. By the time she wakes up, the troll has totally disappeared and, even worse, Hilda is lost in a snowstorm. On her way home, Hilda befriends a lonely wooden man, and narrowly avoids getting squashed by a lost giant. See what I mean? Kind of random, but it’s a randomness you want to embrace because Hilda’s adventures are so magically drawn. There’s a depth in the thoughts and discussions that goes beyond the intended middle-grade audience. 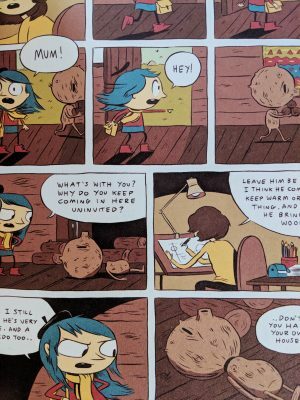 Hilda is also a brilliant role model for young girls in particular. She’s independent, artistic, resourceful and open-minded. One scene that stands out is when she camps out in the rain on her own and feels the fear but then decides to enjoy the cosyness regardless. A little lesson, yet an important one. Resilience and courage are big in this book. Luke Pearson continues to tap into universal emotions throughout the story which is one of the reasons that this is ideal for adults too. It’s always exciting to find a kid’s book that will grow with them and this can be read in different ways. This can be viewed as a picture book, as an exploration, as a learning experience or as tip-toe into a deeper world. The bonus material at the back is much more detailed. 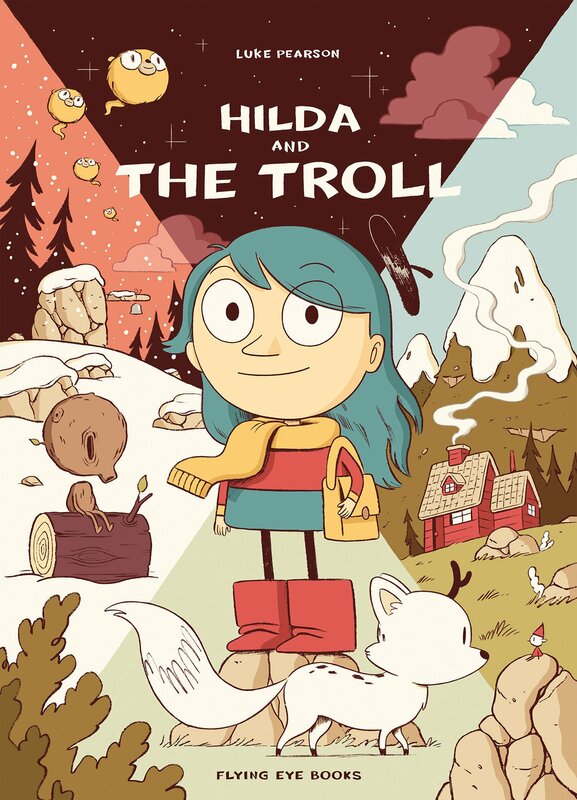 It includes a drawing of Hilda’s bedroom, an extract from a book on trolls, a short story and some sample sketches as well as a preview of the next tale. My minor quibble about this is that it’s too short, but let’s be fair, it is aimed at 8-12 year-olds. And the value goes long even if it doesn’t go wide. The good news is that there are five books in the series (the fifth in hardback) so if you’re hooked by the first then you can easily continue your adventures. 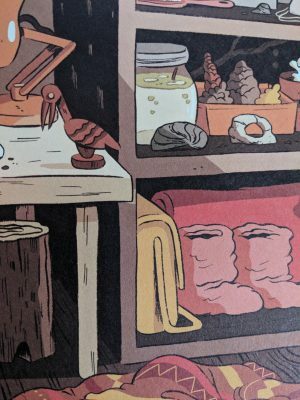 Hilda has also just launched on Netflix and the trailer looks amazing. We don’t subscribe at the moment but we’re considering it just for this series. It goes without saying that we’re very happy that Hilda is now in our lives and we hope it’s the beginning of a long lasting friendship. Each page is a dream – I can’t stop staring at them! I can’t wait to see it! I’d love to read the books first but I’m too impatient!